The implementation of the new European 2030 climate and energy policy framework is one of the most important issues in the climate dossier of the government of Poland. We are fully engaged in the on-going debate on the new proposals, regarding the revision of the EU ETS directive, and determined to achieve the most rewarding results. After reaching a compromise at the European Council level, we are now having a debate in the Council and the European Parliament on the individual elements of that revision. It is of utmost importance for Poland, that the 2030 climate and energy policy is implemented fully, in line with the political decision taken by the European Council at its summit in October, 2014. Bearing in mind that a clear mandate was agreed then, by the Heads of Governments of all EU Member States, I would like to point out some selected key elements of the position of Poland, on the proposed revision of the EU ETS directive. Compensation mechanisms are one of the most important elements of the new EU’s Emission Trading Scheme (EU ETS), not only for Poland, but also for all other Member States with GDP per capita below 60% of the EU average. Both the new Modernisation Fund and the mechanism for free allocation for the power generation sector, should be fully used by all eligible countries, to finance projects which are consistent with their national policies and priorities, and take into account the principle of technological neutrality. In our opinion, the best solution to achieve this aim, would be to preserve the previous architecture based on National Investment Plans. In this context, I would also like to indicate that the Modernisation Fund should be managed by beneficiary Member States, with only a subsidiary role performed by the European Investment Bank, - according to the October 2014 European Council conclusions. Another crucial challenge for the new EU ETS, is to properly address the problem of carbon leakage to protect, as much as possible, the competitiveness of the European economy. In its recent judgement, the Court of Justice of the European Union ordered a re-calculation of free allowances for industry, for the period up to 2020, in 10 months’ time. We must all admit that such a situation has little to do with ensuring as much predictability for investors as possible. Therefore, we are deeply convinced that the only way to avoid such a disturbance in future, is to adopt just one list of sectors exposed to the risk of carbon leakage, for the whole 10-year period, that would remain unchanged up to 2030. In order to prevent the risk of re-calculation of free allowances, we also need to discuss perhaps more thoroughly, the Dutch concept of allocating free allowances based on dynamic allocation. To enable the EU ETS to work, whilst protecting the industrial base in the EU and guaranteeing predictability for industry, we need to have benchmarking rules, based on more representative criteria than before. Bearing in mind the forthcoming debate on the new effort sharing decision in the non-ETS sector, and refraining from anticipating its results, I would also like to stress the importance of the flexible mechanisms in the revised EU ETS. We believe that safeguarding a wide range of such mechanisms (acting on both sides: from the ETS to the non-ETS, and vice-versa), to be used on an equal basis by all Member States, is the best way to ensure that a greenhouse gas emission reduction is reached in a cost-effective manner. In this context, it must be recalled that cost-effectiveness and the economic efficiency of emissions reductions are the prime foundations of the EU ETS. Last, but not least, we should be aware that the EU is not a lonely island, and therefore, a wider, global philosophy of the newly-adopted Paris Agreement should be translated into the revision of the EU’s ETS directive. As we well know, the Paris Agreement was established on some rudimental principles which are, essentially: a bottom-up approach, a more dynamic and flexible architecture, and the concept of carbon neutrality. Those principles do not impose on countries, any obligations to adopt particular tools or instruments, but rather put stress on the results of the whole range of climate actions that really matter. With that in mind, I would like to point out that far more flexibility in the post-2020 EU ETS than before, would be more than welcome, specifically when it comes to the functioning of compensation mechanisms envisaged by the October 2014 European Council conclusions. That flexibility in a 28-Member EU, especially in the wider scenario imposed by the global architecture of the Paris Agreement, should not, however, be seen as an excuse for not making a considerable effort in reducing emissions, but rather as the EU’s and its Member States’ common sense and ability to adapt to constantly changing circumstances. To sum up, I would like to express my deep conviction that, only thorough and impartial discussion of all possible solutions, would lead us to achieve the best possible results, in terms of the new shape of the EU’s ETS for 2020-2030. We are ready to listen carefully to all the arguments, and I hope that the Polish voice in the debate is loud enough, and is listened to with equal attention. Directive 2003/87/EC of the European Parliament and of the Council of 13 October 2003 establishing a scheme for greenhouse gas emission allowance trading within the Community and amending Council Directive 96/61/EC (OJ L 275, 25.10.2003, p. 32–46). The on-going debate on the revision of the EU ETS directive is based on the Proposal for a directive of the European Parliament and of the Council amending Directive 2003/87/EC to enhance cost-effective emission reductions and low-carbon investments (COM(2015) 337, 15.7.2015). European Council Conclusions (23 and 24 October 2014). Judgement of the Court in Joined Cases C-191/14, C-192/14, C-294/14, C-389/14 and C-391/14 to 393/14, 28.4.2016 (ECLI:EU:C:2016:311). 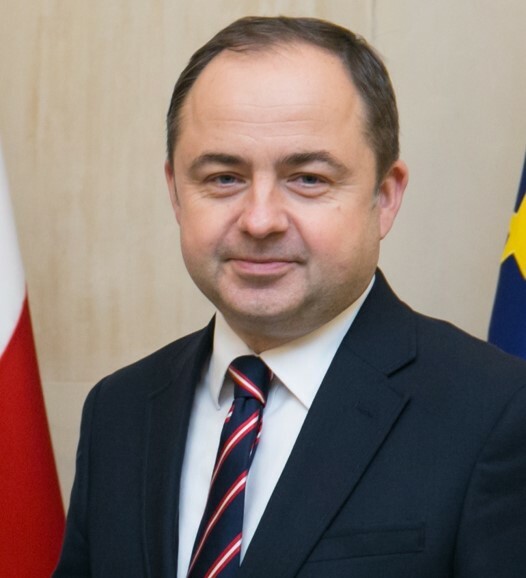 Konrad Szymański was appointed as Secretary of State for European Affairs, at the Ministry of Foreign Affairs in Poland, in November, 2015. He also serves as the Prime Minister’s Envoy for the co-ordination of the participation of the Prime Minister in the meetings of the European Council.